Experience super fast speeds, more pixels in 4K, and amazing power delivery with the USB-C to USB-C Thunderbolt 3 Cable. Compatible with Thunderbolt 3 and USB 3.1, it has the power and versatility to transfer data between two USB-C devices, support a 4K display and power a laptop with up to 60W of charging power, without the need for an additional power cable. 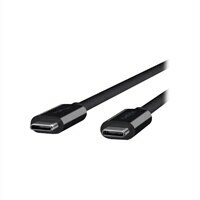 The Thunderbolt 3 Cable supports speeds up to 5 Gbps for USB 3.0. For a USB 3.1 host connected to another USB 3.1 device such as a hard drive, it can support data transfer up to 10Gbps. When connecting two Thunderbolt 3 devices, data transfer rates can reach 20Gbps.